Monday, January 4, 2010: Prepared to depart with a Willie Nelson song on my brain. On the road again…..Just can’t wait to get on the road again…..Oh Crap! Shoveling snow again…..Oh how I hate to be shoveling snow again; so I can get on the road again! 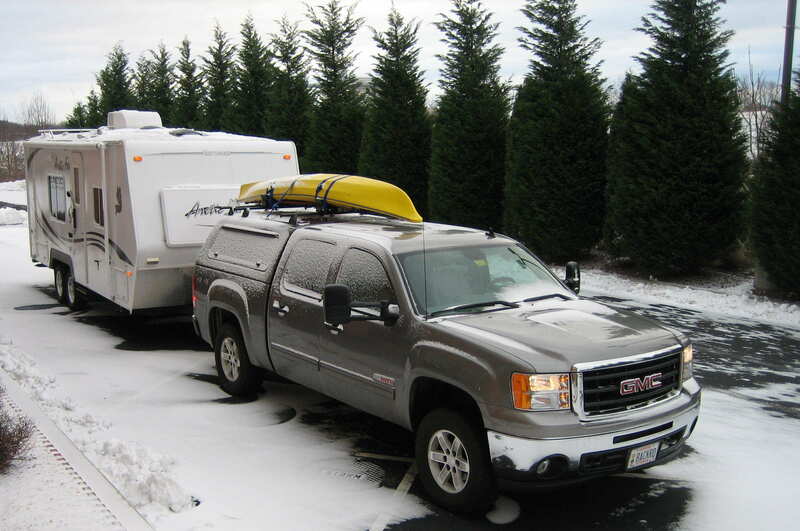 Tuesday, January 5, 2010: On the road again…..just can’t wait to get warm again. I can’t wait to get on the road again. Kit tells me it is 0618 which I have to take her word for because since I retired I don’t wear a watch and the clock in the dash is blinking “12:00”. Now I’m not smart enough to develop a website. The fine web page work is the product of my brilliant son-in-law Kevin. Thanks, Kevin! Our goal this trip is to post these journals on the website as well as send them out as a Word attachment. Hopefully this will satisfy those folks who just want to go online to check up on us while accommodating those that have mentioned they like to download and print the journals. Traveled the traditional “Lucy” route from home through New Hampshire and Massachusetts. Remember Lucy? Traffic was light and for the most part the roads were good. Kit took her traditional kit-nap and Lucy and I managed not to go awry. We passed north of “The City” on the Tappan Zee Bridge and encountered a sign that said “trucks, buses and RV’s move to the right lane”. Dutifully following the road sign we stayed right and were shuttled off the turnpike to encounter a toll booth. There stood a toll taker and another person (her supervisor?) who asked for $4.50. All the other traffic passed by toll free on the other side of a string of Jersey Barriers!?!? Apparently the purpose for collecting tolls from just some of the traveling public is to pay the lone toll takers salary….and that of her supervisor. The state of New York couldn’t even afford a proper sign…..all they could muster up was a hand lettered cardboard one! It’s getting late and after driving over 500 miles while passing through 7 different states it is time to stop for the evening. We considered Hamburg, PA but settled on Hershey, PA. I guess we were getting hungry. How about that….two Pennsylvania towns next door to each other that basically cover all the major food groups. Since the trailer was still winterized and it was cold we stopped at a Comfort Suites and stayed the night in a great room with a mini kitchen, a whirlpool tub next to the bed and a sitting/office area. All for $65.00! The desk clerk even panned one of their security cameras to watch the truck and trailer to keep an eye on it for the night. The recession has really driven room rates down. Gotta keep heading south and to warmer weather. Normally we like to travel the back roads but in order to make better time, we decided to take I-81S through Maryland, West Virginia, Virginia and on into Tennessee. For all the bad press I-81 gets we found it to be a great road to make quick time toward the southwest. There is a lot of large truck traffic but I usually feel more comfortable traveling in a group of long haul trucks then in the company of the average automobile. If you give the long haul trucker the courtesy they deserve then they will usually reciprocate. Besides traveling amongst professional drivers gives me the confidence that they won’t do something stupid like pull around and get in front of you just so they can slow and get off at the next exit. 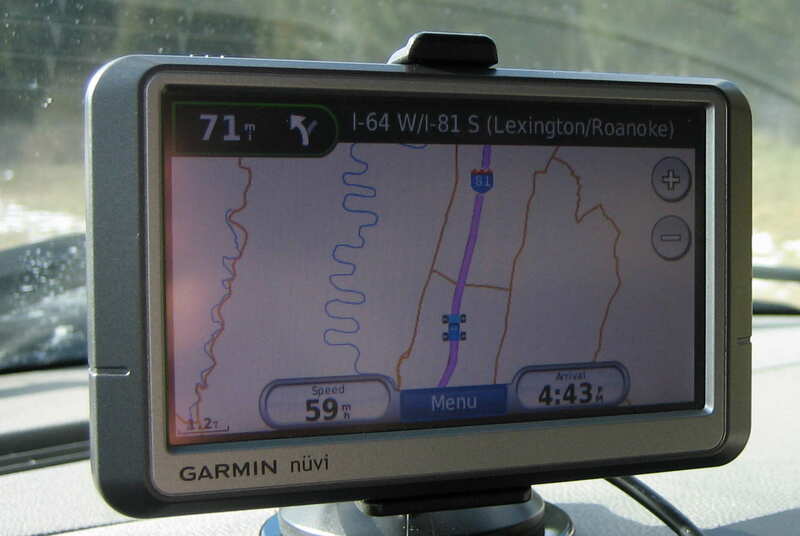 As we traveled through the Shenandoah Valley I noticed on the GPS an interesting squiggly road and was tempted to pull off and check it out. But Kit noticed the squiggly line on the GPS was blue and likely not a road but a river. Still tempted to check it out as I brought my kayak this trip…..but the truck thermometer read 24 degrees. Maybe on the way back in the spring. Stopped at an RV friendly Cracker Barrel restaurant in Kingsport, Tennessee for an evening meal and then decided to stay at a local Comfort Inn. 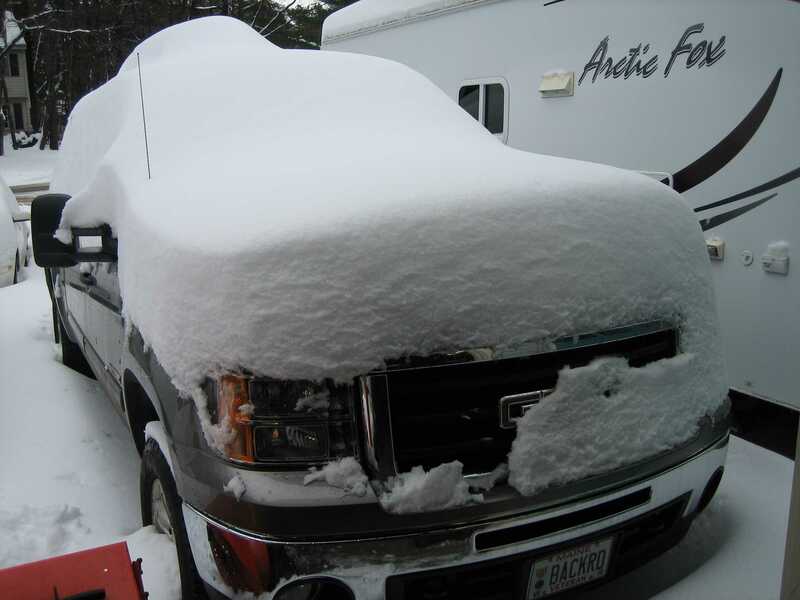 Still to cold to camp…..the desk clerk mentioned there was a major winter storm coming tomorrow and we may want to get an early start. Thursday, January 7, 2010: Up early and checked the weather. 19 degrees and clear in Brunswick and 12 degrees and overcast with a “Winter Weather Advisory” In Tennessee!…..double yikes!! Then we learned the predicted snow accumulating was 2 inches! All the local schools and businesses had closed…..some already closing Friday as well!?!? Enjoyed breakfast at the hotel and climbed back on I-81S. Traffic very light…..just the long haul truckers and us. Roads were fine, a few flurries with little accumulation on the road. The biggest problem was visibility with all the light snow being blown around. One of the ironical ironies of road trips occurred this morning. I-81 in this part of Tennessee was designated “The Albert Gore Parkway”. Now…..the outside temperature is currently 17 degrees…..in Tennessee…..so much for global warming! His former constituents are freezing their bajingles off. Good thing he invented the internet so we can see how cold it is. 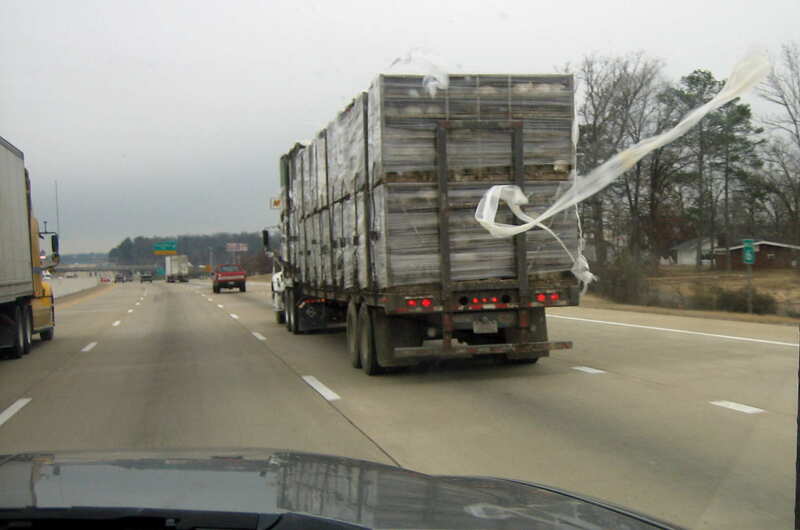 My guess is that it is hauling bathroom tissue and the load had gotten loose. Kinda like when the paper gets stuck on the bottom of your shoe and you walk through the airport terminal and no one has the decency to tell you they just laugh and point…..you know, kinda like that! Or so I’ve heard. Anyway, it was an interesting and unusual sight as we followed the truck for many miles…..cheap entertainment. The snow did pick up as we neared Lookout Mountain. Following the lead of the truckers we reduced speed but kept traveling with the understanding that if it got much worse we would pull off for a few hours and wait it out. As we descended into Birmingham, Alabama the temperature warmed to the mid 40’s and the snow turned to rain. Noticed the fields and lawns were green and the hardwoods had most of their leaves. At least it has been warm in these parts recently. Pulled into Meridian, Mississippi for the night and stopped at the Bonita Lake Campground. Now a Bonita is a species of tuna which is obviously a salt water fish so not sure how the lake actually got its name. Maybe Al’s global warming has melted some of the polar ice caps and they swam the 500 miles inland? We decided to stay in the trailer even though the overnight temperatures were predicted to be in the 20’s. A friend had e-mailed us that she couldn’t leave a comment so I posted a test comment. But you know I don’t think I have ever passed three test’s in a row. From the sounds of things this past week, it doesn’t appear as though you’ll have really landed anywhere warm! Love to follow your travels…….met and talked with you last year at a dinner at Pat and Sterlin’s on Coffee Pond. We live on Coffee Pond in the summer…are in Melbourne, Fl. for the winter. Think it is wonderful that you travel so much and enjoy life…..what a way to go!!!! !